Bringing my chopper in bits back to Aus. Buying as many replacement pieces as I can here in the US before sending it home (in a different shipment). Does the speedo need to be in KPH. I'm sure the answer would be yes, but just wanted to check. I need a speedo with oil, nuetral and indiciators and the models I've seen, the price different between a KPH and MPH is worth asking the question. I'm quite interested in this question, too. There are neat li'l Biker's Choice speedos with 4 indicator lights (blinker, high beam, neutral & oil), but from what I was told by US sellers, the 2.1:1 (what I needed) is only available as MPH, whereas they have a 1:1 in KPH. I ended up buying the MPH one with a plan to convert it to KPH, but that's looking more difficult/expensive than I thought it would be. So yeah, the answer to this is one I'm interested in. Just registered an 87 Heritage with MPH speedo with no problems.In fact all that was required for the RWC was a correctly biased headlight insert ($21.00) and the indicators/running lights set up for Oz, which meant buying a plug in unit ($100.00) which does the job for you. I guess the powers that be reckon it is your responsibilty to "correctly adhere to the posted speed limits" and are more than happy to slug ya if you don't. If you take your speedo to reputable speedo tech he can put a dab of speedo paint at the appropriate pionts for kmh so as to sorta avoid fines me personally i like mph speedos even if i do get caught out . I used to just put a spot of white paint on the speedo glass. 50k =30mph, 60k=35mph, 80k=50mph & 100k=60mph. NOt exact but close enouth considereing variying tyre profiles, wear and the wavering of the speedo needle! I only ran a tacho on my 500/4 Honda chopper (meant I didn't have that long cable from the front wheel) for 20 odd years. I initially got a mate to ride beside me and I marked off the main speeds on the tacho glass for top gear. Worked fin and I never got a ticket. I guess I could take a punt on the speedo with all the idiot lights and just put the markers for KPH as discussed. 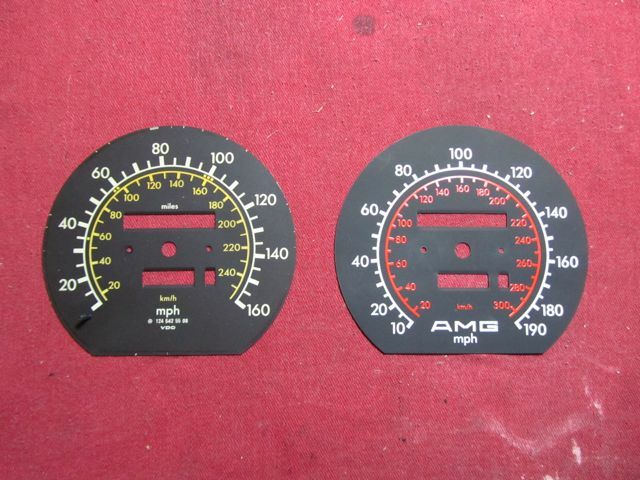 You could go to a sign writer for a bout $5-10 get vinyl cut lettering made and stick the KPH numbers next to the MPH in a inner circle like some of the early cars that had dual gauges. AutoCAD, Illustrator or just printing to scale from Photoshop. Shouldn't be very difficult. Have you got the photo in good quality? and know the exact size it needs to be, i.e a scaled reference point?? Take the image on a USB stick to your local photoprint point (Target, Kmart, photolab) and print as a photo. Then laminate it with a flat or satin laminate. You should be able to work it out circular in degree increments. And there are several points that match up for particular speeds. Dual face like these may make it easier. On this dial it says (Km x0.6214) = miles this obviously can go in reverse to determine your odometer. Last edited by Aussiehard on Sun May 06, 2012 5:43 pm, edited 1 time in total. Some importers fit a Kph to MPH 'speedo converter'. This is a tiny device, sometimes electrical other times mechanical. These convert the signal to the speedo from KpH to MPH. They may then simply put an MPH sticker over the Kp/h scale to hide it. Many who have a car fitted with a speedo converter still opt. to also have replacement clock faces fitted. DON'T KNOW HOW MUCH THEY ARE OR WHERE YOU FIND THEM. Take a photograph of your Kmh speedometer and bring it to the computer. Click ChooseYour Dials and select the Lockwood MPH speedo you believe to be the one you need. Next, compare your Kmh speedo with the Lockwood speedo. Then using the diagrams below as a guide, follow the steps outlined. (If you get stuck, give us a ring). Ignore the MPH scale on the Lockwood dial and concentrate only on the Kmh scale, (that's the smaller inner scale), and carry out the following three checks. 1. Check that the Kmh scale on the Lockwood speedometer, starts and finishes at exactly the same positions as the Kmh scale on your speedometer. 2. Check that the Kmh calibrations at the 3 o’ clock and 9 o’ clock position on the Lockwood speedo correspond exactly with the Km/h positions at 3 o’ clock and 9 o’ clock on your speedo. 3. Check that the Kmh calibration at the 12 o’ clock position on the Lockwood speedo is identical with the Kmh calibration at 12 o' clock on your speedo. The two clocks below are simply an example to show you how to make the comparison. Remember, you are only comparing the Km/h scale (the smaller inner scale) on the Lockwood dial. If the Kmh calibrations match yours at all of these five positions this could be the conversion dial you are looking for. We supply clear, easy to follow step by step fitting guidelines with many of our dials. Hundreds of thousands of ordinary car owners have fitted Lockwood replacement dials in their cars. 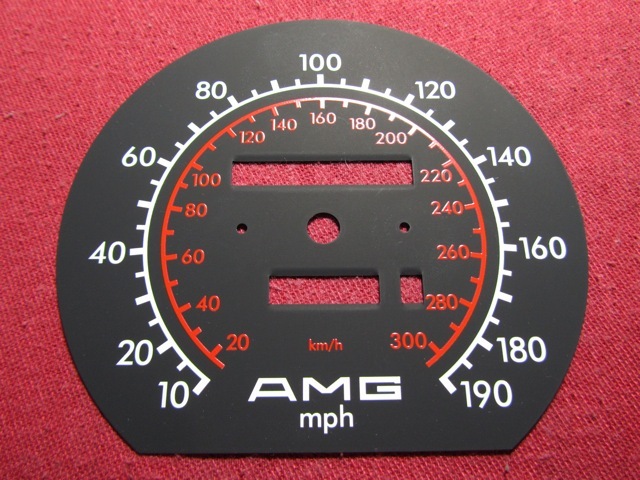 If you just want to change your speedo but there isn't one available in the original colour, a dial kit from our extensive range of white or coloured 'designer' dials could be your solution. I tried overlaying the above on your dial, problem is the start and finish points are quite wide on yours so even the other 140mph faces don't align. Thanks a lot, when I was trolling for face images, I never managed to find as many as you did. Some of the ones that you came up with appear fairly close to the arc I need, I'll have to get off me bum and see about mapping one across. Now that's scary, trolling through the lockwood site (thanks for the pointer), the speedo dials which appear closest at this point (until I can overlay a translucent image), are for a Kia Rio, hey, if the scaling is right I'll happily take it!